MISSION, KS--(Marketwire - September 20, 2010) - (Family Features) Most people could recognize a Robin or a Cardinal if they saw one -- but what about a Northern Flicker or a Lazuli Bunting? Even with several hundreds of bird species in North America year-round, many backyard birders are unfamiliar with some of the birds specific to their region. If you'd like to meet some unique feathered friends, follow these simple tips on how to attract them to your own backyard. Birds have simple needs: food, water, shelter and places to raise young. By establishing these elements in your outdoor living space, you can make beautiful birds in your region feel right at home. In addition, incorporating these basic elements can help certify your backyard as a wildlife habitat by the National Wildlife Federation. Water Birds need a dependable supply of fresh, clean water for drinking and bathing. Placing a birdbath, especially one with a trickle or fountain, makes your garden a very desirable spot. John Robinson, Scotts chief ornithologist, recommends using a low, shallow birdbath, where birds normally find water. "Birds will naturally be attracted to water sources found at the ground level even more than those placed on pedestals. This is especially true if the source is in the shade to keep the water cooler," he says. Also, if you have a pond or stream, remember to add some flat rocks where birds can perch while drinking or bathing. Shelter Birds seek shelter at different heights. Make your garden more hospitable by growing vines, shrubs and trees. Evergreens provide excellent winter shelter, as well as protection from cats and other predators. Cavities in a dead or dying tree make great nesting spots. If there's one in your yard, let it stand unless safety is a concern. Nesting Many bird species will use the same plants that provide shelter as nesting spots. You can put up nesting boxes that will be used by species such as bluebirds, chickadees, wrens, woodpeckers and even owls. Wild birds spend most of their time foraging for food such as insects, fruits, nectar and seeds. Many birds may require up to 10,000 calories a day and enjoy sampling a wide variety of foods. Therefore, providing numerous feeding options is the best way to keep them returning to your backyard habitat. Growing a variety of plants that bloom and produce fruit, seeds or nuts at different times throughout the year attracts even more birds to your backyard. Many perennials, grasses, vines, shrubs and trees also are food sources. Naturally, native birds thrive on native plants, so selecting regional beauties that produce seeds, berries, or nectar increases food sources as well as shelter and nesting materials. Check with a local nursery to get advice on what plants are native to your area. To supplement their diet, fill feeders with high quality wild bird food. Not all birds enjoy the same seeds. Birds found in one area of the country may be different from birds in other regions. A great way to ensure the birds in your area are receiving the nutrition needed is to look for region-specific wild bird food, like Scotts Songbird Selections Regional Bird Blends. To learn more about bringing unique birds to your backyard, sign up for the Backyard Birding e-newsletter at www.scottswildbirdfood.com. Identify birds with the National Wildlife Federation "Field Guide to Birds of North America." Find it at www.shopnwf.org. Find state and regional backyard bird guides at www.songbirdgarden.com. Learn how to participate in the Great Backyard Bird Count at www.birdsource.org. Learn more about participating in a Christmas Bird Count by contacting your local Audubon Society Chapter: www.audubon.org/bird/cbc/. Check with your local cooperative extension office to learn more about native plants and creating a backyard habitat for the birds in your region. Have your garden certified as a wildlife habitat by visiting the National Wildlife Federation website at www.nwf.org. 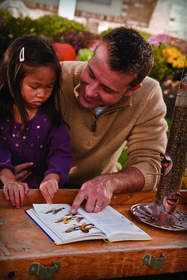 Find out which species are visiting your feeders with the Bird Identifier at www.scottswildbirdfood.com. Here are just a few of the unique regional birds.